It doesn’t get any better than gazing at the breathtaking Hong Kong skyline at night with a delicious cocktail in hand. Here is a wrap up of the best bars in Hong Kong with views. Order yourself a martini, sit back and ogle at the dazzling views of Victoria Harbour below. As far as views go, Ozone Bar (the highest bar in Hong Kong) is the best of the best. Located on the 118th floor of the Ritz Carlton, the tallest hotel in the world, Ozone Bar is a sleek and sophisticated venue with a price tag to match. Expect cosy booths and a lavishly decorated interior of gold and marble. You can’t beat their narrow alfresco terrace on a summer evening – you will feel like you are sitting in the clouds. Try to book ahead and reserve one of their corner tables where you can enjoy near 300 degree views. On a clear night, you can see as far as The Peak. 118th Floor, The Ritz-Carlton Hotel, International Commerce Centre, 1 Austin Rd. Above and Beyond is one of the hottest restaurants in Hong Kong right now, and for good reason – the food and location is exceptional. Located on the 28th floor of the Hotel Icon, Above and Beyond Bar offers exquisitely prepared dim-sum and seasonal Cantonese cuisine in a stunning atmosphere. Perch on one of their plush sofas and ogle through the floor to ceiling windows at the stunning views of Victoria Harbour and Tsim Sha Tsui East below. The wine list is exceptional – there is even a walk-in wine cellar focusing on French vintage. A sommelier is always on hand to provide wine matching options. Level 28, 17 Science Museum Road, Tsim Sha Tsui East, Kowloon. If you’re after some swanky cocktails in the city, look no further that Sevva – a penthouse bar on the top of the prestigious Prince’s building. This über plush bar offers 360-degree views of the city. Expect delicious cocktails, quality food and some of the best desserts in town. Don’t miss the Marie Antoinette’s Crave – a macaroon and candyfloss topped cake. 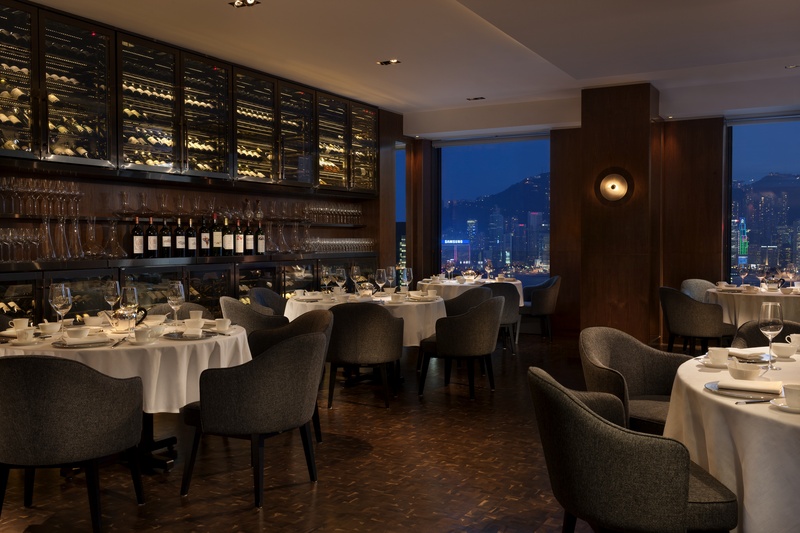 The best seats in the house are on the wraparound terrace overlooking Victoria Harbour and the glittering skyline. Make sure you dress to impress and prepare yourself for the “suit” invasion which tends to take over during lunch and for post work drinks. Fourty-nine-levels levels up in the Upper House, designed by Andre Fu, Cafe Gray Deluxe is the epitome of sophistication and elegance. The 14 metre long bar takes centre stage in the 21st Century grand Cafe and is a popular spot to watch the cocktail makers at work. The signature cocktail menu features mainly champagne inspired cocktails, so if you’re a champagne lover you have come to the right place.Head chef, Gray Kunz, brings his unique style of European classics and signature dishes from a lifetime leading the very finest kitchens in Europe, Asia and America. Located on the top of One Peking in Tsi, Sha Tsui, Aqua Spirit continues to be one of the most popular bars in Hong Kong for locals. Venture to the restaurant downstairs and you can choose between two distinct dining options; Italian with Western style seating and Japanese with traditional tatami style. This is a fusion inspired menu at its best.The cocktails menu is out of this world. Stay late for a clubby atmosphere where DJs spin tracks until the wee hours of the morning. These look great! I’m getting even more excited about my trip now. Thanks for sharing this post with me!